messy. Because today, on September 15, the world will be celebrating National Linguine Day. The pesto’s been mixed, the shrimp boiled, and now all you have to do it throw it all together. Linguine, which means “little tongues” in Italian, is among the oldest versions of Italian pasta. 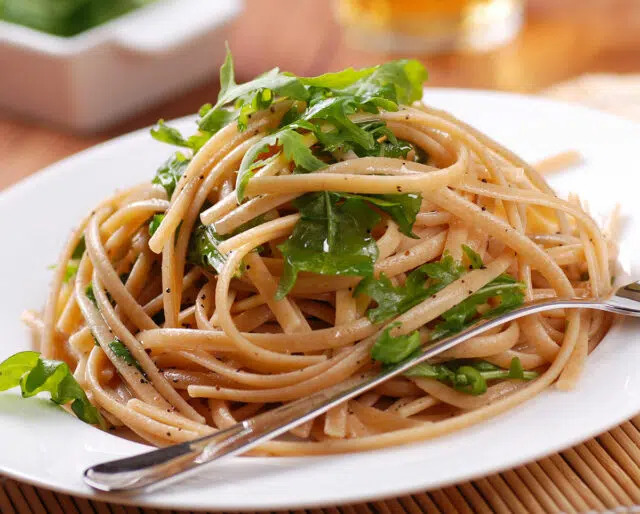 Along with its cousin fettuccine, the signature linguine shape started appearing in bowls across the Liguria region of Italy around 400 years ago. Over the years, linguine has made a name for itself as the deserving starch bed for pesto and seafood, as opposed to typical red and meat-based sauces. Its arrival opened up new doors for Italian cuisine, and chefs haven’t looked back since. Once you see how easy it is to make homemade pasta, you’ll wonder why you haven’t been doing it all along. To make proper linguine, you’ll need a pasta press, but that’s all the special equipment that’s necessary. Start with a cup of flour and two eggs, mix by hand, and in no time, you’ll see your own pasta start to take shape. To throw a truly authentic party, try giving it a Ligurian theme, named after the region from which linguine hails. Known for its seaside villas and colorful rows of maritime houses, you can decorate your own house to match. Include some local drinks like vermentino or sciacchetrà —and of course some heaping portions of linguine — and you and your guests can jetset to Genoa for a lot cheaper. Even if it’s not homemade, you can still make linguine the center point of a fantastic evening with friends and family. If you don’t typically serve “family style” with your friends, give it a try. Have some people over, give everyone a duty when it comes to cooking, then all sit down around the table with an Italian feast before you. It’s quite a departure from the BBQs typical of this time of year, but it’s a fun, different way to get together with friends. For pasta lovers who also deal with the harsh symptoms of heartburn, linguine and its typical dishes are a godsend. Replacing tomato-based sauces and red meat with white wine, cream, garlic, or pesto sauces means you can eat heartily, but spare the heart. While eating linguine and only linguine itself wouldn’t do much for your health, creating recipes that are based on the Mediterranean diet will certainly serve your soul well. Pasta of any kind is a key ingredient in many typical Mediterranean dishes, and can be paired with vegetables, beans, lentils and even fruit. So while it’s true everything should be taken in moderation, you can relax on September 15 knowing you’re not doing any harm to yourself by gorging on some linguine. While the rules for pasta aren’t set in stone, there are definitely a few best practices to follow. One of the most important is how to pair sauces with types of pasta. Thanks to the delicate, light nature of linguine, it’s perfect for light sauces, either cream or oil based, that feature buttery seafood. Clams, shrimp and mussels are also easy pairings, and make for a great late summer meal.